To reverse a journal entry in QuickBooks 2013, first display the Make General Journal Entries window by choosing the Company→Make Journal Entries window. QuickBooks then displays the Make General Journal Entries window. Use the Previous and Next buttons to page through general journal entries that you’ve already entered. If you’re using QuickBooks Pro: Print the general journal entry by clicking the Print button. Then, using the printed journal entry as a reference source, enter a new journal, except with the debits and credits reversed. In other words, if the to-be-reversed journal entry debits cash for $500 and credits interest income for $500, you enter a journal entry that credits cash for $500 and debits interest income for $500. If you’re using QuickBooks Premier or QuickBooks Enterprise Solutions: When you find the journal entry that you want to reverse, click the Reverse button. (The Reverse button appears along the top edge of the Main tab of the Make General Journal Entry window.) QuickBooks reverses the general journal entry by entering a transaction into the next accounting month with the debits and credits flip-flopped. Typically, you won’t want to fool around and later change the journal entries. However, if you do feel the need to make changes, QuickBooks provides an Edit menu with commands that you can use for just this purpose. 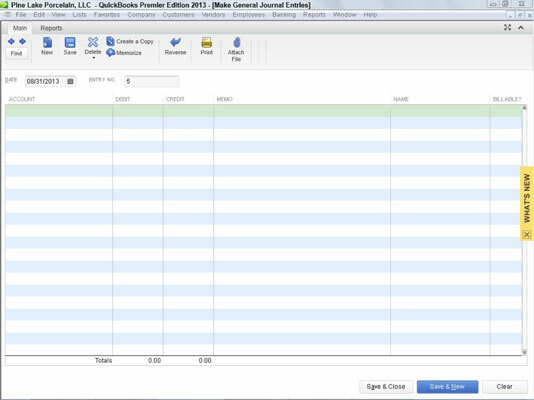 For example, QuickBooks supplies a Delete General Journal command that you can use to delete the journal entry shown in the Make General Journal Entries window. QuickBooks also supplies a Void General Journal command that you can use to void the general journal entry shown in the window. Typically — and again, you already know this — you don’t want to delete general journal entries. Instead, you want to void them. Enough said.